Thieves have several ways to steal your card information. With skimming scams, you hand your information over to them without even knowing it. With a hidden camera or a stealthy bystander, they can even get your PIN and make cash withdrawals from your account. Installed skimmers: skimmers are often installed where you normally swipe your card: on ATM machines, gas pumps, and payment machines at merchants. They are difficult to see – just a piece of plastic over the normal card slot, but there’s a tiny computer inside. Skimmers can quickly read everything they need when you use your card, and they store that information for thieves to harvest later (some skimmers send the information wirelessly, which reduces the risk for thieves). In many cases, skimmers do not interfere with your transaction, so you don’t know that your card number has been stolen. Your card passes right through the skimmer, and everything seems normal. Handheld skimmers: skimmers can also be “mobile” devices, tucked away in a pocket. For example, when you hand your card to a dishonest waiter to pay for dinner, it only takes a second to run your card through a skimmer while walking back to the cash register. Additional equipment: in addition to the card reader, skimming scams often use hidden cameras and other equipment to capture your personal identification number (PIN). The cameras can be surprisingly small and well-hidden, and they may be part of furniture or fixtures that look like they belong where they are. Another technique is to alter the keypad (possibly by placing a fake keypad over the original one) with a device that records your PIN. Heat-sensitive cameras on mobile devices can also help with figuring out your PIN. Card numbers get stolen all the time, and sometimes you have no control over it (the number could have been stolen by hackers from a store you shop at, for example). You simply change cards, and the risk is gone – but it’s a hassle to change your card number and wait for a new card. To avoid problems, make it harder for somebody to steal your information. Know your location: it’s best to swipe your card in secure areas and avoid insecure areas. 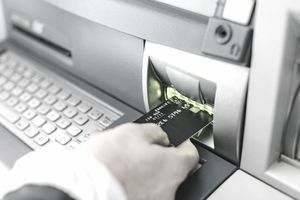 For example, an ATM located in a bank lobby is relatively safe (the bank is locked at night, the ATMs are regularly serviced, and there is constant video surveillance at the site). Thieves take a risk when they install and retrieve their skimmers – they don’t like security cameras. Pay-at-the-pump terminals at a gas station are not as secure. Protect your PIN: when you enter your PIN, no matter where you are, cover your hand (with your other hand). This makes it harder for cameras to record your PIN, and it prevents anybody from watching what you enter. Out of place: if something looks odd, walk away and use a different machine. Skimmers sometimes stick out an extra half-inch, but many of them are extremely well-designed and difficult to spot. You can also give the card reader a little jiggle before you insert your card. If it’s loose, that’s a red flag. Don’t accept “help”: if you get offers to help from strangers hanging around the machine, decline the offer and leave. They may say they were having trouble also and you just need to enter your PIN again. Keep your card: almost all waiters and merchants are honest. However, if you’re ever worried, don’t let anybody walk away with your card – even for a few seconds. Walk to the payment machine with them and watch the entire process. Use secure payment methods: when you have the option, pay without swiping your magnetic strip through a card reader. Mobile wallets like Apple Pay encrypt your information, and touchless payments can also be secure. Contact your bank immediately: if anything strange happens, contact your bank as soon as possible. If an ATM keeps your card or you notice that you’ve used a device with a skimmer, your bank can act quickly to avoid losses. You’re often protected from fraud in your account, but your liability increases as time passes. Eventually, smart cards with chips will reduce the effectiveness of skimming scams. However, magnetic cards are still regularly issued and used, and you often only need a card number (with additional information like a zip code) to pay for something online. Until the entire world moves away from magnetic stripe payments, skimming will still be fairly easy (although you can destroy your magnetic stripe if you’re confident that you’ll never need it).